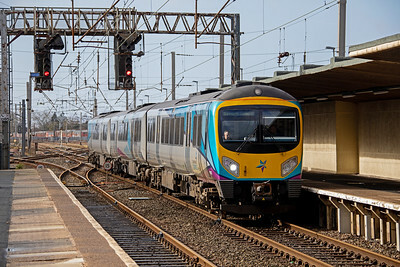 With more spare time due to semi-retirement, I've decided to record the contemporary railway scene, primarily in North-West England. Work in progress (2017)! 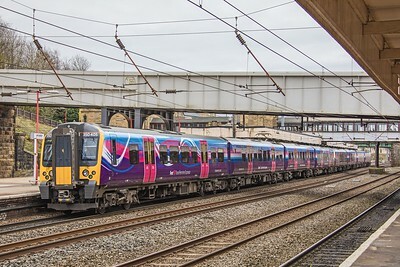 185 125 rolls into Carnforth with the 09.57 Preston to Barrow on 14th March 2019. 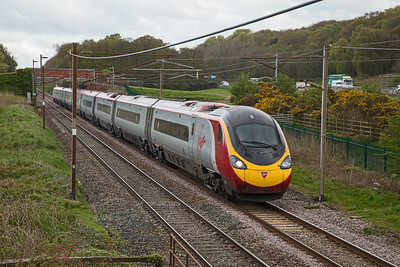 Northbound Pendolino, Atherstone, Warwickshire. 6th March 2019. 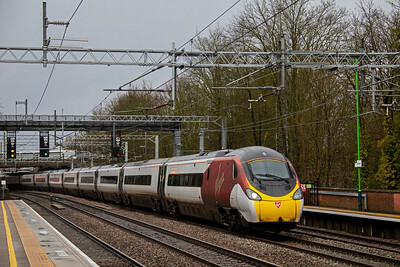 Southbound Pendolino, Atherstone, Warwickshire. 6th March 2019. 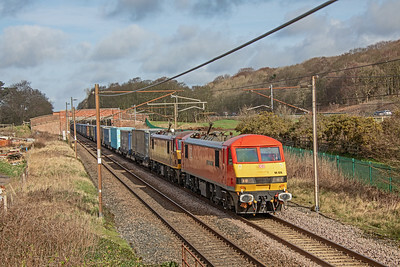 90.016 and an unidentified classmate approach Atherstone whilst working 4S44, the 12:13 Daventry-Coatbridge intermodal on 6th March 2019. 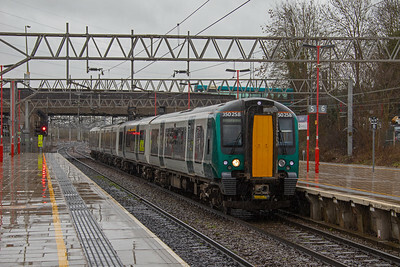 350 258 arriving at Stafford in the pouring rain, when forming the 11.01 Birmingham New Street to Liverpool Lime Street on 6th March 2019. 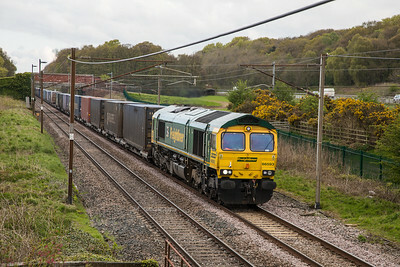 66 104 passing Stafford with the 09:12 Trafford Park-Southampton intermodal on 6th March 2019. 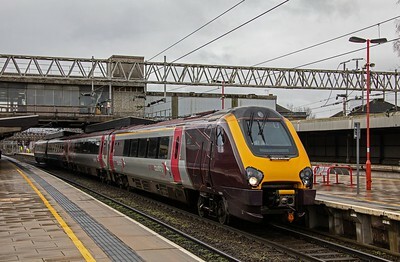 Cross-Country Voyager forms the 09.00 Bristol - Manchester service at Stafford on 6th March 2019. 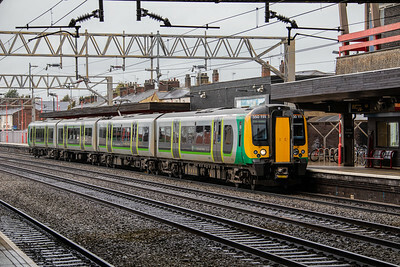 350 111 calls at Stafford with the 10.02 Crewe - London Euston (via Stoke) on 6th March 2019. 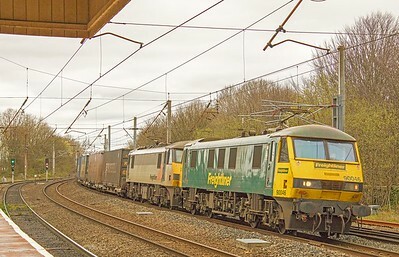 90.028 paired with 90.020 glide south along the WCML @ Woodacre with 4M25; 06:06 Mossend-Daventry intermodal. 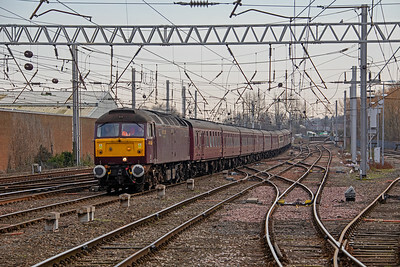 88010 'Aurora' glides through Lancaster on the 'down fast' with 4S43, the 06:16 Daventry-Mossend 'Tesco Express' on 23rd February 2019. 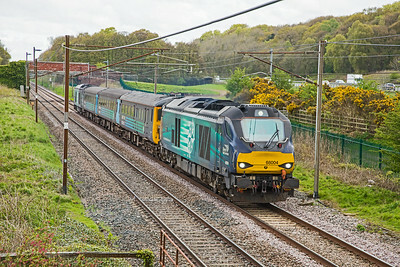 The 10.03 Preston - Barrow service approaches Hest Bank on 30.04.18. 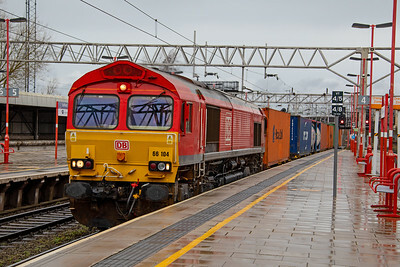 68004 (with 68017 on the back) glides along the WCML @ Woodacre with the 05.15 Carlisle - Preston service on 30-04-18. 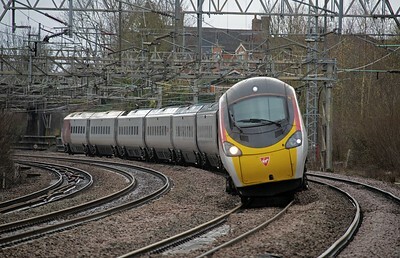 These loco-hauled train will cease to operate on the WCML after the changes for summer timetabling. 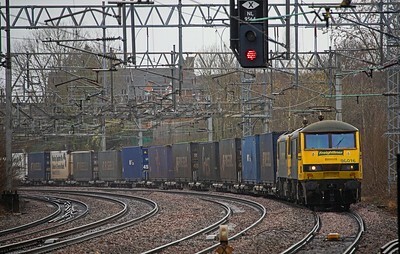 Said to be the final week of Class 37's on the WCML Preston - Barrow trains. 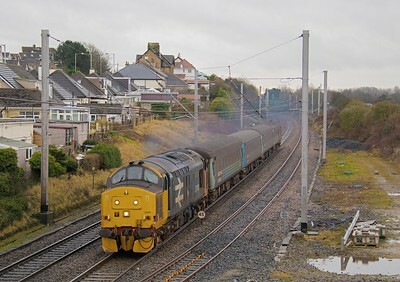 37401 hurries through Hest Bank on the 10.04 Preston - Barrow service on 23rd January 2018. 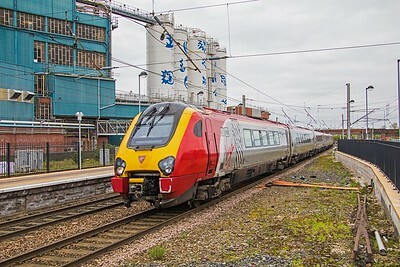 Virgin Voyager 221 103 rumbles into Warrington Bank Quay whilst forming the 10.00 Glasgow Central - London Euston (via Birmingham) on 7th April 2017. 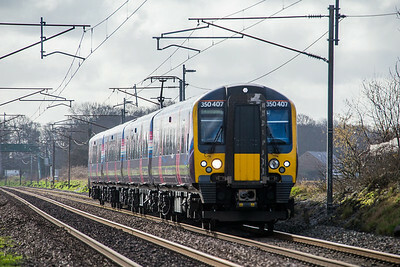 350 405 calls at Lancaster with the 10.00 Manchester Airport to Edinburgh 'Trans Pennine Express' service on 7th April 2017. An unusual shot in that platform 4 is the main southbound platform and not normally used by express trains heading north! 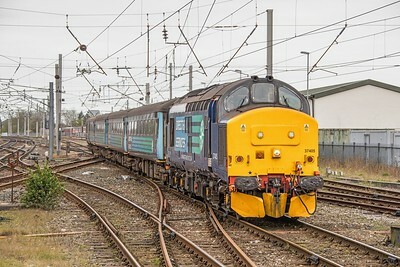 37 405 is seen again, working the 10.04 Preston to Barrow service, approaching Carnforth on 7th April 2017. This locomotive was built by English Electric as D6982 at their Newton-Le-Willows factory in May 1965! 68024 leads classmate 68020 as they swing through the reverse curves on the 'down fast' at Lancaster with the 06:16 Daventry-Mossend 'Tesco Express' on 7th April 2017. 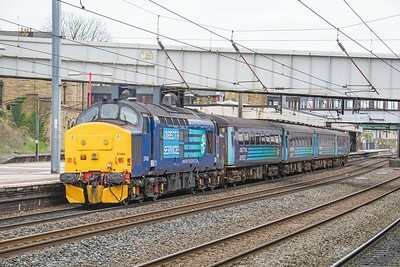 37 405 propels the 05.15 Carlisle to Preston service (via the Cumbrian coast route) into Lancaster on 7th April 2017. 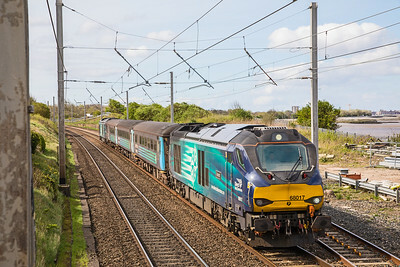 These loco- hauled services make a pleasant change from what is now essentially a DMU/EMU railway! I was keen to see how the new Canon would handle very gloomy conditions and shot this at ISO 2000. 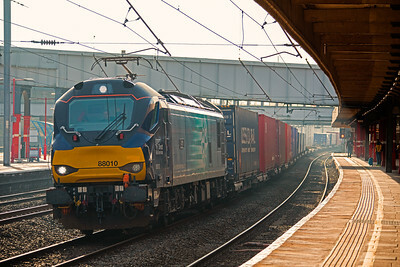 90046 and 90044 glide through Lancaster on the 'up fast' in charge of 4M27 the 05:25 Coatbridge-Daventry intermodal service. 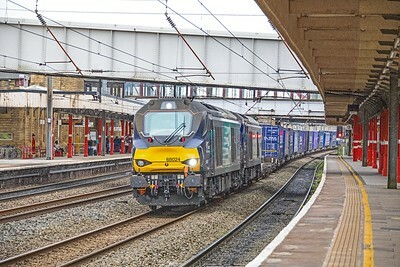 Both locomotives were built in 1990 by British Rail Engineering Ltd (BREL) at Crewe and each packs an impressive 5000bhp. One of the much maligned 'Pacers' 142 036 pauses in Preston station whilst working the 07.19 Blackpool South - Colne on 7th April 2017. 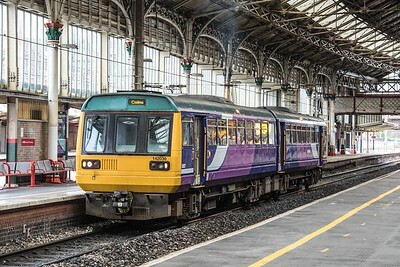 The 'Pacer' trains are all due for scrapping by 2020. This insignificant piece of junk holds the honour of being the first railway photograph taken with my brand-new Canon EOS 5D Mk iv ! 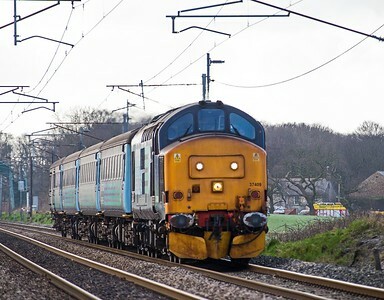 The 10.04 Preston to Barrow hurries north along the WCML at Woodacre (Garstang) behind DRS Class 37, 37409 on 24th February 2017. 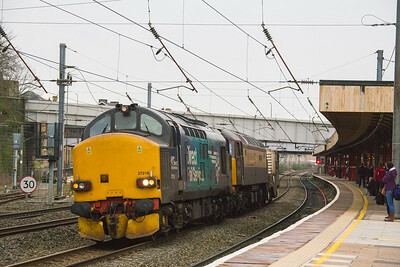 350 407 forms the 09.00 Manchester airport to Glasgow Central at Woodacre on 24th February 2017. 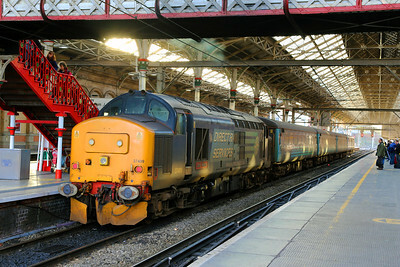 37409 awaits departure in sunlight and shade at Preston with the 10.04 service to Barrow-in Furness on New Years Eve 2015. I find it incredible that these vintage machines are being used for front-line passenger trains more than 50 years after they were built. I need to get out and record more of these movements, so long may they continue!